When trying to determine whether a hearing protection device (HPD) can be effective for use in a given noisy environment, the conventional method has been to examine attenuation using SNR(SF84), its NRR(SF), or its derated NRR. Going to extremes, the individual mean octave-band attenuation values might be compared to the octave-band levels of the noise of concern to determine what the Assumed Protective Value (APV) might be with some allowance for the reported standard deviations of the attenuations. All of these values will shed light on how effective the HPD should be in reducing potentially harmful noise to a safe level under the HPD. However, none of these values shed any light on how useable the HPD is in allowing the wearer to maintain environmental awareness. In construction, in manufacturing, and in the military, being aware of what’s happening in the surrounding areas can be as important to personal safety as the HPD is to the prevention of noise-induced hearing loss (NIHL). Comfort, or lack of it including heat buildup for earmuffs. Reduction of necessary auditory awareness. For the military, auditory awareness is critical for troops in combat. Each soldier or marine leaving for a combat zone is issued, at present, the 4th generation of the so-call . It is a multi-flanged, premolded earplug with a passage through its center that passes through an acoustic filter that is supposed to have little effect for sound levels below 120 dB SPL and then increase in attenuation as the sound level increases. The technical label for this technology is non-linear passive level-dependent. This technology has been around for decades and was first developed and tested by ISL in France. Ideally, an HPD such as the Combat Arms earplug would have no effect on auditory awareness for most signals. Similarly, there are HPDs that are powered, either by their own battery or from a battery pack worn by the user that powers the HPD as well as other equipment. The technical term for theses HPDs is non-linear active level-dependent. The word “active” applies to the use of a powered electric circuit that passes all sound from the outside world into the ear of the wearer and then adjusts its gain or volume as the level of the outside sound increases until cutting off. Once cut off, the wearer experiences the full passive attenuation that the HPD provides. These types of devices are very popular among shooters and hunters in non-military applications. It is presently unclear about their deployment for military use. Dr. John Casali at Virginia Tech University (VTU) has been a strong proponent of the importance of the auditory awareness effects of HPDs. There are reported incidences every year of workers who are hurt by equipment because their auditory awareness was impaired by the HPD they were wearing. These accidents include being run over by fork lifts, being run into by robotic parts delivery vehicles, and being hit by moving materials, such as delivered by crane at construction sites. All due to an HPD-induced inability to hear the necessary auditory cues that would have allowed them warning to get out of the way. For the soldier in combat who is using an HPD, the inability to clearly hear the approaching of what could be enemy personal, to hear the bolt noise from a rifle or the sliding in of an ammunition magazine, or even to hear the retort of a weapon fired at a distance can be life and mission endangering. The ability of the HPD user to even detect the presence of a sound either in quiet, in the presence of low-level background noise, or the presence of high-level background noise. Recognition/Identification. The ability to determine what made the sound. The reaction to a friendly sound should be different that the reaction to an unfriendly sound. Consider the swishing of reeds against each other as one fellow soldier returns from the latrine verses the sound of a magazine being slipped into an AK-47 by an unfriendly. Once a sound is detected, it must be recognized correctly and quickly. The last step of DRIL is localization, the ability to quickly determine the direction from which the sound came. In the case of a worker trying to avoid being run over, it’s ­important to know from where the sound of the approaching vehicle came. For the soldier, it’s important to know from where came the sound of the magazine being slipped into a weapon before break out of a fire fight. Though not a letter, it is just as important. Each HPD has its own impact on communication, particularly in the presence of background noise. The COM portion of DRIL-COM evaluates that. In a large space to be as acoustically dead as possible so that all signals generated by the system could arrive at the listener without dealing with room reflections. Further, the technique was administered computer software and electronics. However, nothing was so specialized that it couldn’t be easily replicated by another laboratory; it is not ready for field deployment just yet. 3M 4th Generation Combat Arms™ earplug in the open setting, INVISIO X50™, Nacre-Honeywell Quiet Pro+™, Peltor Con Tac III™, Etymotic EB15LE™. Performance for all the HPDs was compared to ears open with no HPD. What the results showed, in general, was that there was no HPD that was as effective in all the DRIL-COM categories as the open, unprotected ear. While each HPD provided some degree of protection from noise, none allowed the critical elements of auditory awareness to be as effectively managed as ears open with no HPD. Unfortunately, soldiers appear to have figured this out for themselves. Of those going into combat in Afghanistan who were issued the Combat Arms earplug, 30% have come back with NIHL (Noise Induced Hearing Loss) that they did not have upon deployment BECAUSE THEY DID NOT USE the earplugs as they needed to maintain auditory awareness. Of interest was the final combined ranking of the tested HPDS in the DRIL-COM testing. Worse were the Combat Arms earplug, the Quiet Pro max and the Quiet Pro when set to unity gain. Max is when the gain of the HPD is set to full on, which is possible with active non-linear HPDs. Unity gain means that the sound level outside the HPD is the same as inside. These three HPDs (settings) were statistically significantly worse than all the other HPDs tested in all conditions. Following, and statistically different from ears open but not from each other, were Com Tac III unity, Com Tac III max, X50 unity, X50 max, EB15LE unity, and EB15LE max. So, what’s the take away message from the DRIL-COM tests. First is that there is a method that can be deployed to determine the impact of an HPD on auditory awareness. It is not a method that an end user can deploy easily, but it is one that a testing laboratory or manufacturer could set up and run and then assign a number for auditory awareness to their product. Further, manufacturers could work to make sure that their HPDs have as little impact on auditory awareness as possible. “This is why only dB Blockers double-vent their protectors when connecting a radio to them”. Clearly, for the worker who needs 25 dB of protection this may not be important or possible. But, since most workers need 15 dB or less of protection in most situations, and in some need none but work in fluctuating noise levels, auditory awareness may become more important in selecting an HPD than mere attenuation. Second, at present, almost anything that is stuck in the ear or placed over it tends to interfere with auditory awareness. Prior to the late 1970s the pinna (outer ear) was thought to be a vestigial organ. It sits on the side of the head, it is immobile, and best for holding eyeglasses a nd decorating with earrings. But it proved to not be case. The pinna is a critical organ for auditory awareness. It allows the listener to locate origins of sounds in space, it enhances high-frequency hearing, and the central auditory system has learned how to use it. No two pinnae are quite alike, however, and so it is difficult to develop a universal surrogate that can be incorporated into an HPD. Case in point is the Combat Arms earplug. In its open condition, it is simply a tube with a small filter in in that is not supposed to effect low-levels of incoming sound. At face value, it would seem to be the best solution. But the DRIL-COM testing showed it to be the composite worst. Its alternation of the pinna’s acoustics, even though the HPD was deeply inserted. On the other hand, the EB15LEE, which is an active earplug, seemed to be the least destructive in both its unity and max settings. It is a digital processing system that might be further taxed to calculate the harm it has caused ear acoustics simply by its insertion and then develop a new algorithm to make the EB15LE effectively acoustically invisible. That type of protector could take into account the natural acoustics of the pinna and further undo its deleterious effects until it was neutral in both of its setting, unity and max. 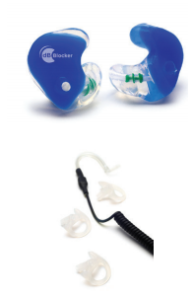 For a passive non-linear HPD to be effective in terms of auditory awareness, it would have to be deeply inserted so that is outer surface was inside the ear canal, much like and completely-in-the-ear canal (CIC) hearing aid, but then it would be difficult to use in both the open and closed settings as the Combat Arms earplug is. There is possibly a solution available, but it would need to be submitted to a DRIL-COM test protocol to prove it. The Virginia Tech Auditory Systems Laboratory (ASL) research effort for the DoD Hearing Center of Excellence was aimed at the development of an efficient, in- laboratory implementable test battery for auditory situation awareness (ASA) that objectively quantified the ASA performance afforded by various Tactical Communications and Protection Systems (TCAPS) and augmented/advanced Hearing Protection Devices (HPDs) used by the U.S. military. Specifically, each of the fundamental ASA task elements of Detection, Recognition/Identification, Localization, and COMmunications, hereafter termed “DRILCOM” ASA elements, was measured in the psychophysical test battery that was the primary deliverable from the research. The individual ASA elements’ scores from the test battery were kept separate so that performance on each element of ASA could be ascertained, and via statistical analysis, the individual elements’ sets of scores were applied to determine the DRILCOM test battery’s effectiveness in measuring ASA afforded by each TCAPS or augmented HPD. The intent was that the test battery would ultimately be deployable in a military audiology clinical or other similar laboratory setting, and applicable to a wide variety of TCAPS and HPDs.